An aerial view of ESO's Very Large Telescope at Paranal Observatory in Chile. A new video from ESO offers stunning views of this facility. A new video from the European Southern Observatory (ESO) gives breathtaking aerial perspectives of its many observatories, which are spread across the Chilean mountain peaks. The first stop in the new video is the Paranal Observatory. 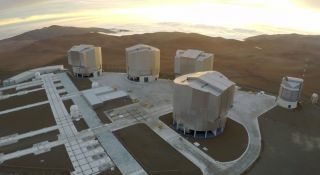 Located 7.5 miles (12 kilometers) inland from the Chilean coast, the observatory's various telescopes together have the largest light-collecting area in the southern hemisphere. Worldwide, it comes in second only to the Mauna Kea Observatory in Hawaii. Paranal houses the Very Large Telescope (VLT), a set of four 8.2-meter telescopes operating in the visible and infrared-light wavelengths. When combined with four smaller instruments, it can function as the Very Large Telescope Interferometer (VLTI), providing imagery at the milliarcsecond level. The site is also home to the Visible and Infrared Survey Telescope for Astronomy (VISTA) and the VLT Survey Telescope. The next site doesn't house a telescope — yet. At an elevation of approximately 10,000 feet (3,000 meters), the peak Cerro Armazones will soon be home to the European Extremely Large Telescope, a 39-meter instrument that will be the world's largest optical and near-infrared instrument. The telescope's mirror will stretch nearly half the length of a soccer field. The telescope is scheduled to see first light in 2024. La Silla is the ESO's first observatory in Chile, home to what it calls two of the most productive 4-meter instruments in the world. The two state-of-the-art instruments are spread out across the peak, with the night sky shining above in glorious visibility. The last stop on ESO's tour is the Chajnantor Plateau, a plain that spreads out at an altitude of 5,000 meters. Here, 50 12-meter antennas make up the Atacama Large Millimeter/submillimeter Array (ALMA). Unlike optical telescopes, each antenna is capable of changing its configuration to change the resolution of the telescope as necessary. An additional array of 16 antennas compliments the structure. The maximum distance between the antennas can vary from 150 meters to 16 kilometers. ALMA began performing science in 2011 with only a partial array before its inauguration in 2013. The video provides an exciting new look at the incredible instruments that are spread across the mountains of Chile.